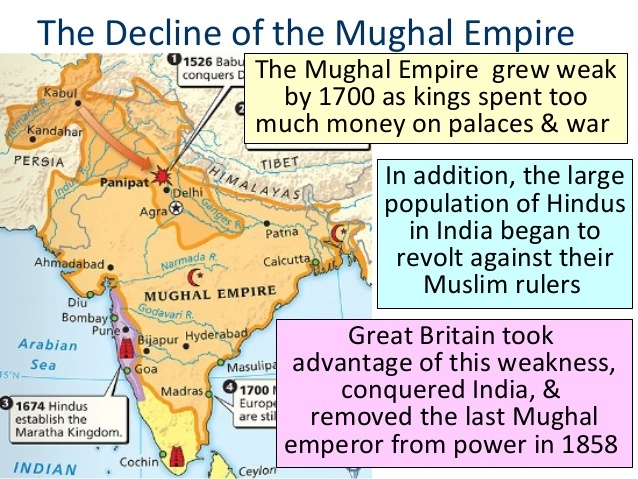 Reasons of Why the Great Mughal Empire Declined in its Power & Glory?? The Mughal Empire was at the peak of its glory during the reign of Akbar and Shahjahan. On one hand, Akbar did a fine job expanding the territories and boundaries of the Empire with his witty military tactics combined with matrimonial associations with the neighbouring states, on the other hand Shajahan did an excellent job of consolidating and maintaining the glory of the empire. 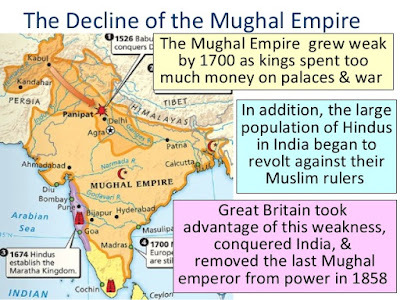 The real downfall of the Mughal Empire began in the last days of Aurangzeb which was caused by a number of discrete reasons which we will discuss in this article. Aurangzeb’s policies and his intolerance was the main reason which led to the decline of Mughal Empire. His forefathers had worked extremely hard to earn the loyalty and support of their subjects, especially the Rajputs and the Hindus. But Aurangzeb paid no respect or heed to the rituals and status of the people who belonged to these communities. He even imposed special taxes known as Jazia on people who belonged to religions other than Islam. He put a ban on the celebration of Hindu festivals which ultimately led to the Rajput and the Hindus removing their support and loyalties. If this was not enough, he even went as far as to execute the Sikh guru and made an enemy out of the Marathas. This pompous attitude of his was not taken very kindly by the Marathas and they were forced to take up arms against him. Aurangzeb was also obsessed with the southern kingdoms or the Deccan. He spent huge resources including his army and heaps of financial support from the treasury on his Southern campaigns, which ultimately drained his empire’s economy and military leaving him exposed and vulnerable. He was a Sunni Muslim and could not even tolerate the Shias and hence turned a big part of the Muslim community against himself. He focused his energy a little too much on simplicity and despised singing, dancing and drinking. These three things or activities were common habits among the people of different religions. All these things combined, nobody liked the idea of a king who went out of his way to make the lives of the general public as difficult as possible. In a way, Aurangzeb himself carved the coffin of the Mughal Empire. Soon after his death the Mughal Empire crumpled. Apart from Bahadur Shah Zafar II, none of Aurangzeb’s successes were competent enough to protect Mughal Empire’s territories from hostiles. It's not like there were no threats during the times of Akbar or Babur or Shahjahan, but they were competent enough to deal with such threats gracefully and effectively. Aurangzeb’s successors spent most of the time enjoying the perks of the royal harems and drinking wine. Their lavish lifestyles did not go well with the shrinking size of the empire’s treasury and also the starving public. There was no clear cut rule as to who would inherit the throne from a Mughal emperor. Therefore, every time an Emperor either died or was imprisoned by one of his own sons, there would follow a bloody war of succession among the sons of the Emperor. Each one would try to influence the members of the court in their favor so that they could put a greater claim to the throne, which ultimately divided the royal court on the basis of favouritism. During Aurangzeb’s time, his obsession with the Deccan drained the treasury of the Empire and hence affected the economic stability. The constant pressure of war was draining the empire’s resources which might be justified if the results were mostly in the Mughals favour. However this was not the case and some of the wars did not even add the smallest of pieces of land to the Empire’s territories. Apart from this, Aurangzeb’s successors spent their lives living lavishly on the expense of the taxes paid by the suffering peasants and merchants. They spent the Empire’s fortune building monuments in their names and as a result, foreign invasions absolutely crumbled the economy of the state. Everywhere the Mughal Army went, they were rewarded with the spoils of war. Given the number of wars which the Mughal army fought, they quickly became lazy, corrupt and inefficient. The inefficiency in the ranks of the Mughal military had spread so far that sometimes they even succumbed to bribes. The army generals refused to march on a campaign without the royal squires and constant supply of women. These are the signs of an army which has been so corrupted and spoiled, that it could not even fulfil the purpose for which it was constituted. As expected, different territories and communities decided break away from the main Mughal Empire and established their own kingdoms. These powers included the Sikhs, Jats and Marathas, who ultimately settled their own independent States. The Europeans first arrived in India as simple traders and gradually started to interfere with the internal politics of India. As we all know, the British Empire lasted for 200 years and this colonisation of India was a result of the complete destruction of the Mughal Empire by the British Empire. The Mughal did not make enough efforts to bring India out of the medieval age and still used primitive weapons in their military whereas the British army had advanced weaponry and superior war tactics which give them an unprecedented edge in Indian history and hence brought down the last of the Mughal Emperors.